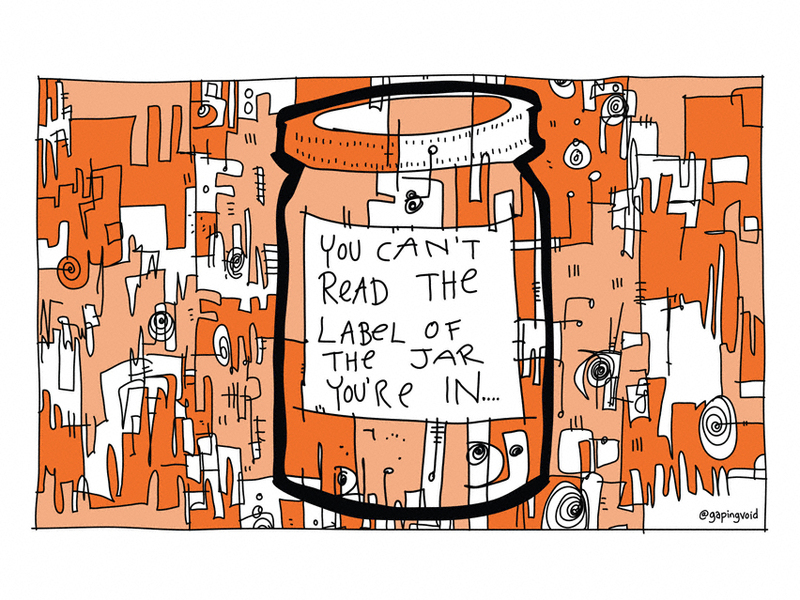 What Jar Are You In? We often assess others by the answers they provide. Those who have the right answers must be the most knowledgeable. We often assess companies based on the mission that drives them and their ability to deliver on it. Those who deliver the most value today are most likely to get our business. We often see another human being for whom we believe they are and not what they aspire to become. Those who are most capable are the ones with whom we tend to partner. But what about the people who are more interested in asking questions than providing answers? What about those companies who are investing heavily in research and development with an eye on delivering more value tomorrow than they are able to today? And what about teammates who look well beyond what they are capable of today in favor of developing skills that will enable them to contribute even more to the continually evolving world of tomorrow? Over the years I have had the good fortune of being a part of many teams, and the biggest indicator of their health as a team, their relevance in the mission space, and the strength of their leadership team was the questions they were asking themselves. Not their ability to answer the questions I would ask upon arrival, but the questions they were seeking to answer themselves. Some teams are focused on merely surviving and some leaders are content with merely not getting fired. I firmly believe that there is a time when business survival is a responsible goal, but those leaders who operate in a way that makes it clear that not getting fired is their measure of success ought to be relieved immediately. When it comes to organizational evolutions, the team to which I am currently a part is beginning to emerge from the survive phase to the thrive phase. The most obvious signal of transition from one phase to another is the questions leaders are asking the team, the questions teammates are asking themselves, and the questions the marketplace is asking the larger ecosystem. What mistakes have we made over the last year and what have we learned from them? How do we know we actually learned and not just observed/acknowledged them? What aspects of our team make you most proud to be a part of it? Which teammates do you value most and why? What were our most significant accomplishments and to what do we attribute those successes? What have we yet to attempt as a team that we ought to consider doing? How are we getting the constructively critical feedback from teammates and customers necessary to guide our continual improvement efforts? Which of our policies and processes are holding us back and need to be eliminated or reshaped immediately? What is the one thing that if we get wrong will be our undoing? How do we ensure we get it right? What other organizations should we deliberately seek out to either learn from or parter with? In which ways do you intend to personally grow over the next year? What is your plan to develop yourself? How can leadership help you with that? How will you and how ought we define success a year from now? Five years from now? Too many teams don’t spend the time to reflect and therefore don’t have a true appreciation for who they are as a team and where they are heading. Unity of effort fades, commitment to a shared vision disappears, and blindspots grow. In the military, too many teams are focused on passing inspections and meeting the minimum. The result is a culture where few teams are truly raising the ceiling across their team and even fewer are focused on raising the floor beyond it. Fortunately, most of the teams I have been on are among those few. But as I look through a more strategic lens, I appreciate my good fortune more and more. It’s not the answers, but the questions. It’s not relevance today that matters, but significance tomorrow. It’s not who you are, but who you are challenging yourself and your team to become. How are you raising the floor?